Times have been tough this past year, that goes without saying, but from my standpoint I have seen many people doing just the opposite of what they should have been doing during these times. What is it that they have been doing so wrong? First of all, I don’t mean to say that cutting expenses is a wrong thing to do – au contraire. Unnecessary expenses should always be out the window. But in our case we should very much avoid cutting the necessary expenses. First and foremost in my mind are the expenses for promoting your company. Yes, marketing. In the past months I have noticed many of my clients and customers in my freight forwarding networks cutting out their advertising expenses, expenses on marketing materials, their traveling expenses and their expenses for going to conferences and exhibitions. I have done my very best to convince them that this is the wrong tactic to take. The very best example I can give them on this is one of the most common. Cutting out marketing is like a farmer who cuts out sewing in the spring because the seeds are too expensive. It’s not good sense. By sucking it in and moving forward with your company promotions during these times you also can give yourself a great advantage over your clients who do decide to cut back their own promotions during hard time. Let me give you a personal example. My main business is mainly promoting business-to-business networking between logistics companies around the world so that they can build up relationships together which leads to business – and cargo. As such I have to do lots of promotions at exhibitions and trades shows around the world that are focused on my target industry. At these trade shows I promote my common brand for our networks and also I prospect for potential clients – network members. On particular show in Munich, Germany, known as Transportlogistic, is very well known around the world. This show happens only once every two years and the expense and time to go there and have a booth at the show is rather steep. Last year we decided to set up a double wide booth at Transport Logistic but after our decision the bottom fell out of the global economy. But I didn’t hesitate in going to the show anyway. And my visit to Munich paid off royally. Why? There were eight halls with over 1000 exhibitors and nearly 48,000 visitors and apparently my competition decided the expense was too costly and they stayed back. So our project cargo group, the Global Project Logistics Network (GPLN), was the only company in this huge exhibition for any potential clients to visit! We beat the competition simply by showing up. I would like to give you another analogy to illustrate what I am talking about here. And this one comes from the world of finance. You probably have heard of dollar cost averaging I would imagine. This is when you invest equally during bear markets and bull markets. Dollar cost averaging is a timing strategy of investing equal dollar amounts regularly and periodically over specific time periods (such as $100 monthly) in a particular investment or portfolio. By doing so, more shares are purchased when prices are low and fewer shares are purchased when prices are high. The point of this is to lower the total average cost per share of the investment, giving the investor a lower overall cost for the shares purchased over time. This same idea works in sales and marketing because of the proverbial pipeline. If you slow down your efforts during low periods when the economy improves your business will not recover as quickly because you have less in the pipeline. By the same token if you constantly “feed the monkey”, as I call it, when times are down your business will be one of the healthiest during good times and bad and you will be at the top of the wave when the there is overall economic improvement. It is that simple. So if you want to eat in the winter you need to plant in the spring. I hope that your business is doing better these days, but if you are still looking at cutting back on something, think twice or three times before going after that marketing budget the count to one hundred then do it backwards. You will thank me for it later! 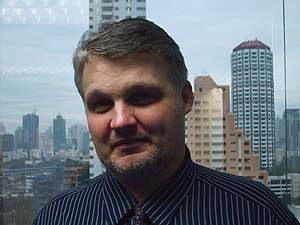 Gary Dale Cearley is the managing director of Advanced International Networks Ltd and is also a columnist and writer. Promotion Points is a monthly column in the magazine Management Systems Asia, where Gary Dale is a regular contributor. You can follow Gary Dale on Twitter by clicking here. Promotion Points: Build the Process – Win the Game! Promotion Points: If you want Brownie Points then Don’t do it for the Brownie Points!